Animals are dying in unnecessary agony because of a lack of understanding over how stunning stops them feeling pain when their throats are cut, research shows. In conventional slaughterhouses, cows, sheep and chicken are stunned, usually with an electric shock, to ensure they are unconscious before their throats are cut. This minimises suffering but in a number of Muslim abattoirs the animals are not stunned over fears it is not permissible, or ‘halal’. A number of industry bodies have spoken out against the slaughtering of animals without pre-stunning, with the British Veterinary Association saying there is an ‘unacceptable time lapse between slaughter and the onset of permanent insensibility [loss of feeling] when animals are not stunned’. 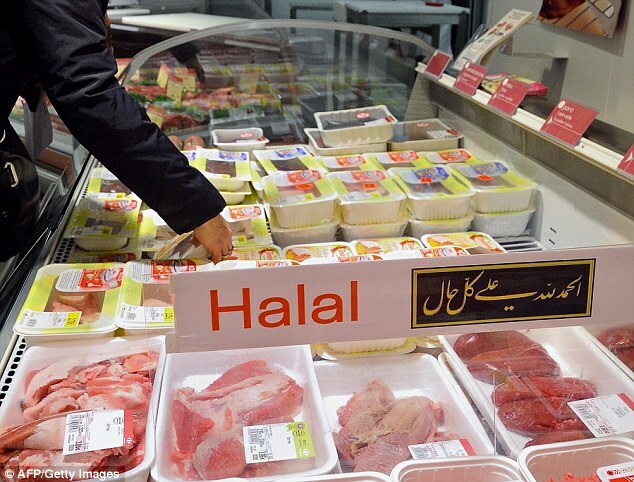 The study said: ‘The lack of understanding of stunning among some scholars has resulted in the issuance of confusing fatwas on the suitability of stunned meat for consumption by Muslims. ‘There is an urgent need for these scholars to be given theoretical and practical education on stunning and other modern slaughter techniques such as mechanical slaughter. Gudrun Ravetz, president of the British Veterinary Association said: ‘Our view is that all animals should be stunned before slaughter, based on peer reviewed evidence that indicates an unacceptable time lapse between slaughter and the onset of permanent insensibility when animals are not stunned. ‘A number of notable bodies including the Farm Animal Welfare Committee and the EU Food Safety Authority all agree that there is a high probability that the cutting of sensitive tissues at the neck will trigger a significant pain response in a conscious animal. ‘Given the barrage of evidence about the humaneness of stunning before slaughter the veterinary profession is persuaded that animals must be stunned.